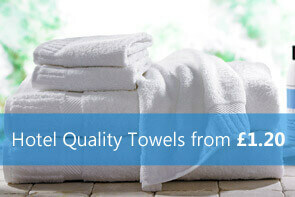 Welcome to one of UK's leading wholesale bathrobe company supplying hotels, spa or for personal use. We supply to the major online retailers as well as high street retailers. 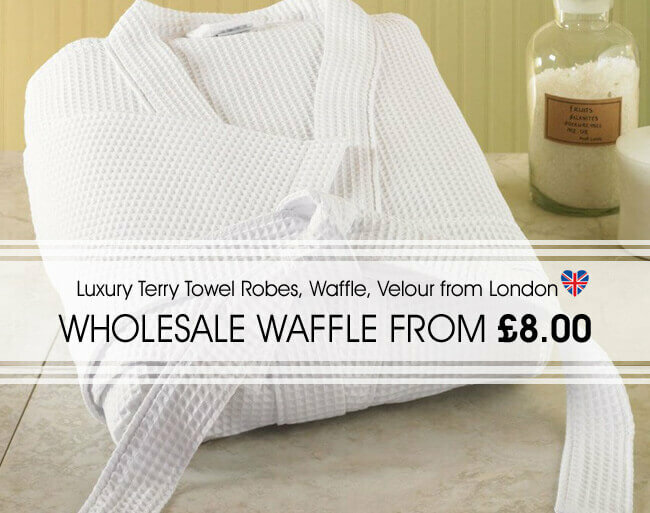 As a wholesale business we source bath robes in large quantities and sell both plain as well as for personalised bath robes needs. 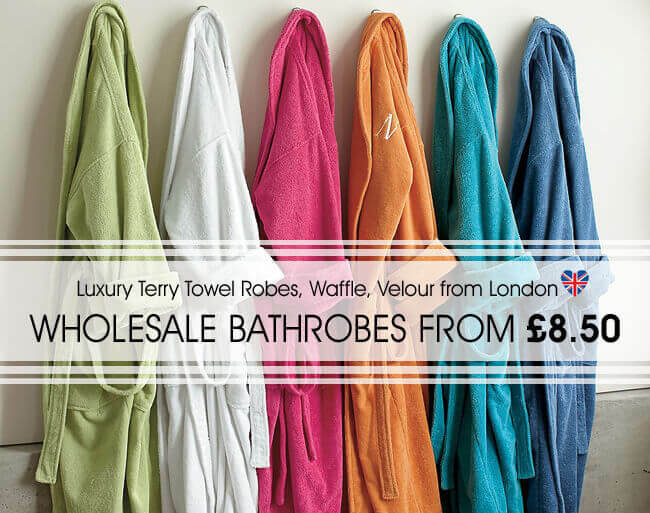 Click on any of the bathrobe links to view our complete collection. If you are a Hotel or Villa customer please call Tel 0208 503 0563 for personal attention to your enquiry.If you want to buy singles then use the below shopping cart (Below price of £18.60 includes the cost of the item plus postage charge for next day delivery). For bulk buy (more than 5 pieces contact us for a better price to save on carriage charge). We just do not supply wholesale clothing but you can also use the online shopping cart to buy single items for personal use. 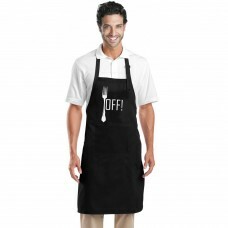 Our custom embroidered or printing service means that you can select any of our range and have it personalised. 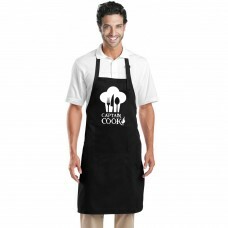 That makes it ideal for hotel, resorts or for bride and groom to have your own logo embroidered on to the gown. We have some 20 years experience in the business which means we have the expertise which many companies do not have. 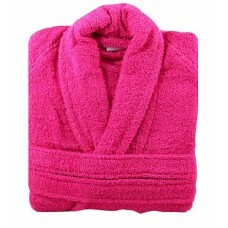 If you are looking for bulk purchase of hooded bath robes then place the order via Email or Phone and receive it next day Delivery charge is only £6.00 for next day (so if you buy 5 bath robes or 30 of the robes the carriage is still £6.00 for next day delivery). 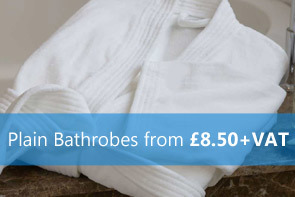 Place your orders via Email on sales@bathrobesuk.co.uk, Tel (0208 503 0563). For same day delivery then for orders which require delivery within London we can get the clothing to you the same day! Our prices for personalised service for hotels or luxury yachts is the most competitively priced. Contact for a monk up artwork of how your design will look. For more information give us a call. All prices on the site are excluding VAT. 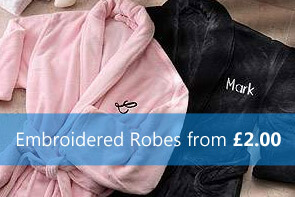 Hoodie robes & have your embroidered logo for gifts from £2.50 embroidery cost. We only stock quality products which are ethically made clothing. 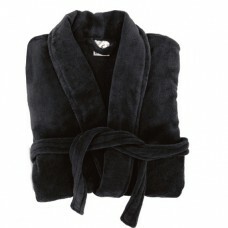 To guarantee you receive the quality hooded bath robes we source only from the best factories which comply with ISO 9000 rules and standards. For more information on our ethical policy contact us for more information. 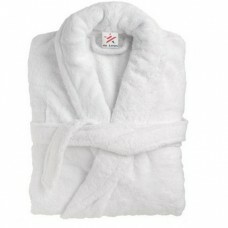 We ensure we have in stock of white bath robe for immediate delivery all year round. If you require embroidery work then contact us with the artwork for an instant quote. Our ability to make small runs of embroidered clothes means we can cater for wedding personalised gift orders. 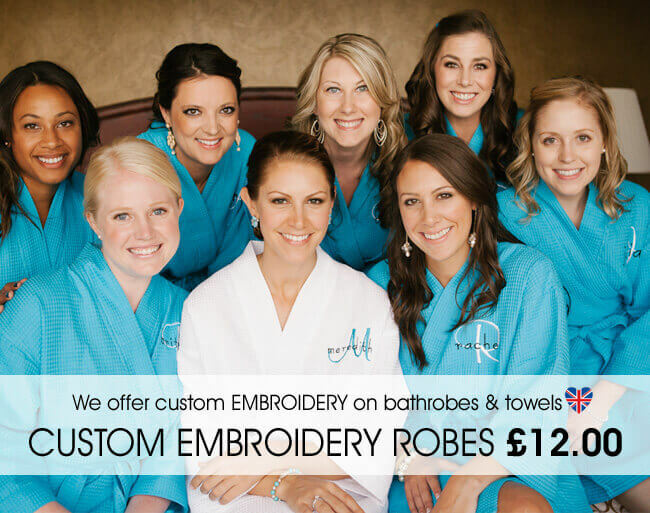 If you are looking for wedding personalised bathrobe then our quick turnaround service means it is ideal for those quick gifts. 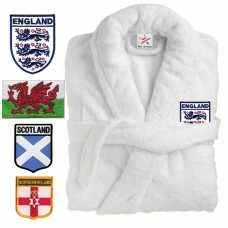 You can customise robes with any logo which you require. Besides the classic towelling fabrication we also offer a very light weight for women 180 GSM quality in 100 cotton single jersey fabrication in the classic kimono style. It comes in 2 colours which are white and pink, light fabric, soft on skin, tie front and short style. 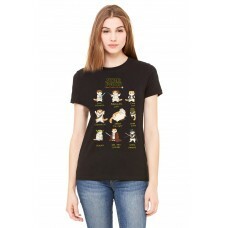 Comes in 3 basic sizes Small, Medium and Large. Ideal for wedding nights and can easily be decorated using transfer printing or rhinestones. The fabric is made from soft combed cotton 30 single yarn and knitted to give it an inherent soft and stretchability characteristic. We are proud to have completed a recent order for a distinguished TV personality. Our reliable service and stocked garments means we can turn around orders very quickly. Our huge stock especially in particular white bathrobes means we can cater for needs of large FIVE star hotels or resorts. 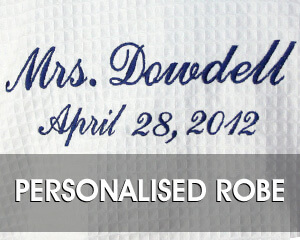 If you require embroidery with 'Mr' and 'Mrs' for wedding gifts then we offer that service as well. 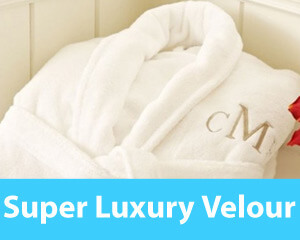 Coupled with that each bath robe can be custom name personalised. Our experience in working with fabrics like terry which have a loop on the surface which can be quite tricky to embroidery means our customer get quality products all the time. If customers have a specific logo which they want us to set up on our embroidery machine for future use then we can keep the DST files for the embroidery for an indefinite period of time. That is good news since once the set up charge is paid customers do not need to pay that again for embroidered clothing. 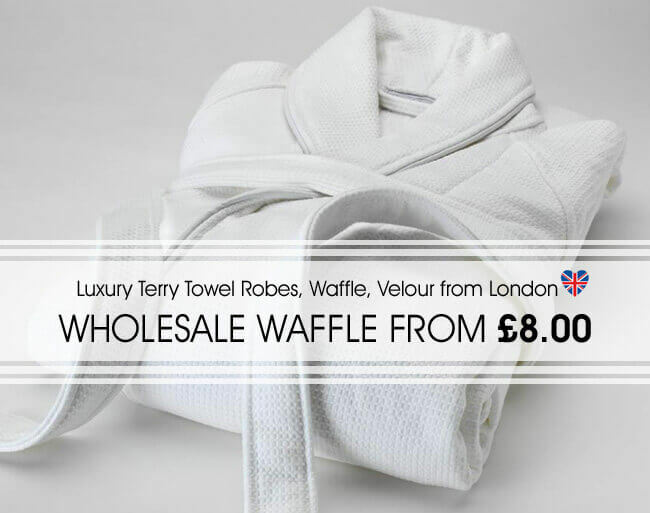 Our clients range from Individuals, wedding personalised gift companies, spas, to Five Star Hotels who all need quality bathrobes at great prices. We pride ourselves for having served some of UK's Five Star hotels and bed & breakfasts. 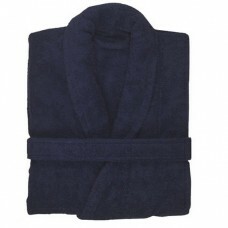 Our consistency in quality in bath robes means clients place regular order with us for immediate delivery. 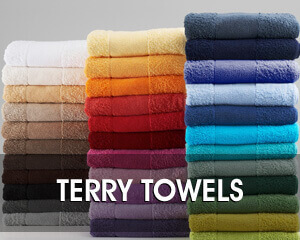 Our 100% towel bath robes are made from the finest soft quality cotton yarn to ensure the finished product has an additional softness. We also offer a great range of children gowns which are made from the same soft terry cotton material. The children bath robes can be brought at the same wholesale prices and the custom embroidery service is also applicable on the kids robes as well. We offer a guarantee next day delivery service from only £6 for one box in which we can fit up to 30 garments or personalised bath robes. That means if you order 5 items or 30 items the delivery charge is the same. Embroidery on the clothes can take approximately a week to process. For orders for same day delivery service contact us for more information. Our export service means clients in main land Europe can have our clothing range delivered from as little as £7 for one box in which we can fit up to 30 bath robes. If you require a bespoke service where a custom colour is specially made then we would require more time to have it manufactured (around 7-8 weeks). If you require velour (for that velvety finish), pique cotton, zero-twist or gowns made from bamboo yarn then contact us for more information.